We have just concluded out amazing fall 2017 season. And with that we’ve decided to show you all who was the champion of all of our regional tournaments! The axe throwing league participants vary from club to club and consist of young, old, female, male, athletic, not athletic. There is no previous skill or requirement for joining a league. 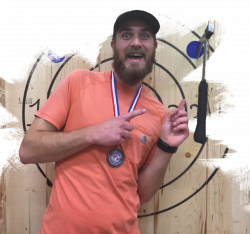 Over the next few weeks we’ll highlighting the many winners of the regional tournaments at Bad Axe Throwing and those same people who went on to compete for the World Axe Throwing League’s World Championship! Without further ado, here is the Winnipeg champion for fall 2017! Anyone can learn to throw even in stilettos. Thor, because he throws hammers, f**k hammers. There you have him! The Winnipeg Champion! Make sure to check back over the next few weeks as we feature all the regional champions! The next axe throwing leagues will be starting January 15th or January 16th of 2018. Register online at Bad Axe Throwing or at your local urban axe throwing club. Prices are approximately $15/week for eight consecutive weeks. Want to try axe throwing in Winnipeg? Book an event today – spots fill quickly! And make sure to follow us on Instagram and Facebook to see awesome throws, goofy group shots, and epic fails! It will be sure to make time go quickly before the next season of league starts up! Bad Axe Throwing Washington in the Media!